Gold hasn't been a very good investment in recent years. As a result, neither have gold stocks. Here are three gold-related stocks that could break that trend. Historically, gold hasn't really been a great investment. The one notable exception was an incredibly strong decade from the early 2000s to late 2011 when it gained over 632% in value. Over that same period -- which in fairness included the worst stock market crash in eight decades -- the S&P 500 generated less than 10% in total returns. But since peaking in late 2011 at over $1,800 per ounce, it hasn't gone so well for gold, or many gold stocks. Gold has lost about 37% of its value, while stocks have surged 188% in returns including dividends paid. That's not to say that there aren't any good gold-related investments to consider, and the precious metal, along with companies heavily tied to it, can offer exposure to a different asset class. So we reached out to three regular Motley Fool contributors for an alternative perspective on some gold stocks worth watching right now, and they came back with Barrick Gold Corp (USA) (NYSE:GOLD), mining equipment giant Caterpillar Inc. (NYSE:CAT), and gold streamer Royal Gold, Inc. (USA) (NASDAQ:RGLD). Searching for a way to gain some gold exposure in your portfolio? Keep reading to learn why these three companies could offer exactly what you're looking for, and why you should watch them now. Rich Smith (Barrick Gold): I don't think it's any great secret that I'm not a big fan of gold -- or gold stocks -- for investment. That being said, even poor investments can deliver decent returns when you buy them at the right price, and if you ask me, Barrick Gold stock is approaching a good price to buy. Or at the very least, it's approaching a less bad price than what it cost three months ago. 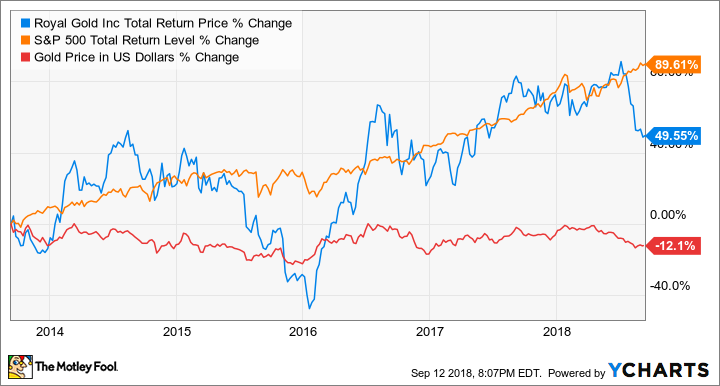 In June, I rated Barrick Gold "underperform" on Motley Fool CAPS because, at the time, Barrick stock wasn't generating anywhere near as much real free cash flow as it was reporting in net income. Thus, I argued the stock wasn't as cheap as its low 10.7 price-to-earnings ratio suggested it was. This wasn't a popular opinion, but with Barrick stock down nearly 21% since I panned it -- against a 4% rise in the S&P 500 -- I'd argue it was the right one. Fast-forward three months, though, and Barrick Gold has now reported three money-losing quarters out of the past four and now sports a negative P/E ratio -- but positive free cash flow of $474 million. Granted, at a valuation of 25 times free cash flow, I still wouldn't call Barrick stock "cheap," exactly. Still, given the reversal in fortunes, I'm actually beginning to think that Barrick Gold stock might now be cheaper than it looks -- perhaps even cheap enough to merit a bounce in stock price this month. Travis Hoium (Caterpillar): Betting on specific gold miners can be risky, because they're dependent on factors outside their control, such as the price of gold and, in many cases, currency fluctuations, depending on the country they mine their gold in. Caterpillar isn't directly affected by gold, but it's indirectly a huge beneficiary of rising gold prices and increased mining activity. Resources accounted for $2.5 billion in sales during the second quarter and $411 million in segment profit. Demand for mining equipment is directly driven by commodities such as gold, silver, and copper, but Caterpillar doesn't have to take a direct risk in any of these commodities itself. There's also little risk that a specific project goes sideways or a currency moves in an unexpected way, two risks that are common in smaller gold mining stocks. In short, Caterpillar gets exposure to some of the macro moves gold and other commodities make without risking everything on one commodity or one project. Caterpillar also has nice value for investors, which isn't often easy to see in speculative gold stocks. Shares trade at 15.5 times trailing earnings and it pays a 2.4% dividend yield at recent prices. Gold and mining isn't the only factor that will keep profits high, but that's the beauty of investing in a company that has multiple end markets to go with gold mining. Jason Hall (Royal Gold): Gold mining is a really capital-intensive, expensive business. It's also subject to the whims of gold prices, which can be incredibly unpredictable, since gold speculators -- not gold's utility or commercial value -- can swing the price up and down with little notice or rationality. This is one of the big reasons I generally avoid gold miners. But Royal Gold, which is a gold streamer and not a miner, has been a very profitable long-term investment. And I think it's likely that remains the case. Royal Gold essentially provides gold miners with financing of a sort. It gives miners cash up front for the right to buy gold at certain prices in the future, generally a certain discount to market prices. Mining companies get much-needed capital up front in exchange for a portion of gold production that it agrees to sell at a reduced rate, while giving Royal Gold access to the precious metal at below-market prices. 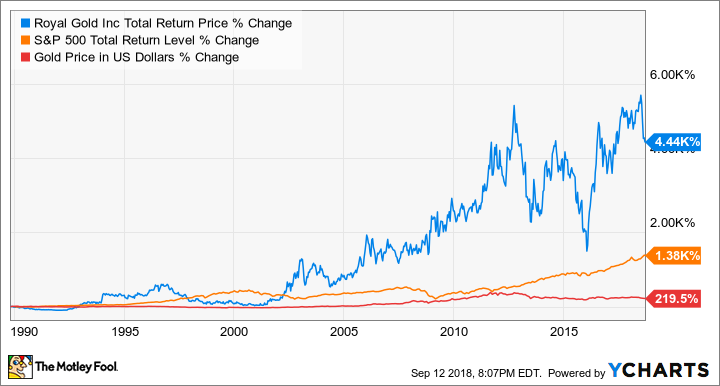 It hasn't matched most stocks in total returns during the recent bull market, but this is evidence that Royal Gold can make money even during conditions many gold miners struggle under. The recent sell-off in its stock -- down 22% in less than three months -- makes it worth putting on your watchlist. Trading for less than 15 times its operating cash flows, this is as cheap as Royal Gold has been over the past decade.